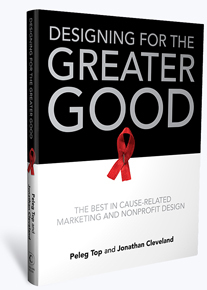 Designing for the Greater Good: A New Book by Peleg Top and Jonathan Cleveland - Available Now! After nearly a decade of studying cause marketing campaigns, I know that strong design is absolutely crucial to success. A gifted design team can breathe life and power into work that might otherwise be lost in the twister of advertising messages that swirls around us from morning to night. If the world were just and fair, the virtue of a message alone would make it stand out in the marketplace of ideas. Alas, that is not the case. Doing good is not good enough. Association with a worthwhile cause is not some sort of magical pixie dust that eliminates the need for excellent communication strategy, tactics and design. Great design is especially crucial to cause-related work because the media budgets behind it are so often miniscule. A commercial campaign with a $100 million budget behind it can survive mediocre design. A cause-related effort relying primarily on donated media must jump off the page, handbill or screen to grab the attention of every consumer that sees it. And yet this truth—that design is key to cause marketing success—is not universally appreciated in the nonprofit world, an arena in which marketing itself was considered a necessary evil by many not long ago. Organizations driven by consensus decision making are especially challenged to produce programs incorporating great design―anyone who has attempted art direction by committee knows how often that produces muddled work. Designing for the Greater Good is a valuable addition to the cause marketing literature for several reasons. It is a unique showcase of campaigns that stand out from the crowd. This collection of work, often created in spite of low budgets and organizational impediments, should be an inspiration to creatives, nonprofit and corporate marketers alike. Do not make the mistake of keeping this book to yourself. Explore its pages and mark your favorite examples. Then share your discoveries with colleagues to help them envision how much more effective your efforts could be with an investment in great design.